The one and only thing that annoys me about Summer is that you've got to take extra care of the body! Ha, how lazy and disgusting does that sound? But I just mean you've gotta shave more often and plan your outfits about how spiky your legs are. Highly annoying if I'm honest. Therefore, I've recently got a few products on the go in my little body care routine that I thought I'd share. Firstly when I'm gonna shave I like to make sure I've fully exfoliated, as exfoliating helps to bring any ingrown hairs back to the surface and also gets rid of any dead skin cells ready for shaving. For this I've been loving the Scrub of Your Life from Soap & Glory. It's more like a body polish than a harsh scrub, which is why I like it before shaving. It's gentle and it really leaves my skin ultra shiny and smooth. Now usually I would use shower gel or Dove soap to shave with, but I was recently sent the SASS Intimate Soothe & Smooth Shave Gel* and now I can't imagine using anything else. I can't believe the difference it makes to my skin. I mean, I've used shave gels before (you know the ones that turn into foam) but this is different. It's a clear gel that feels thick, luxurious and a pleasure to shave with. It's so gentle and soothing, that at £10 I think it's completely worth it. To shave with, I absolutely always use Venus from Gilette, dunno why, I just always have done. I recently picked up the new Venus Snap Razor, which is a travel version that uses the same cartridges as the full size version. It comes in a cute little plastic case which is really handy for travel. Once I'm shaved and out of the shower, obviously I like to moisturise, which I'll be honest I don't always do, but I try and make sure I do when I've shaved. Recently I've been absolutely loving The Body Shop's Virgin Mojito Body Butter*. Now we all know how popular their body butters are, and this one smells exactly like Twister Lollies. What's not to love? Last but certainly not least is deodorant. I've been using the Sure Women Maximum Protection Cream Deodorants since last summer and I haven't looked back. Hands down the BEST deodorant I've ever tried. They're the kind of deodorant that you keep getting whiffs of throughout the day and keep you bone dry even after the most active of days. On the odd time I'd ran out and had to use a run of the mill spray deodorant, I certainly noticed a difference and swiftly ran to Boots to purchase another. They do a few different scents in the range and I've tried them all and they're all fab. 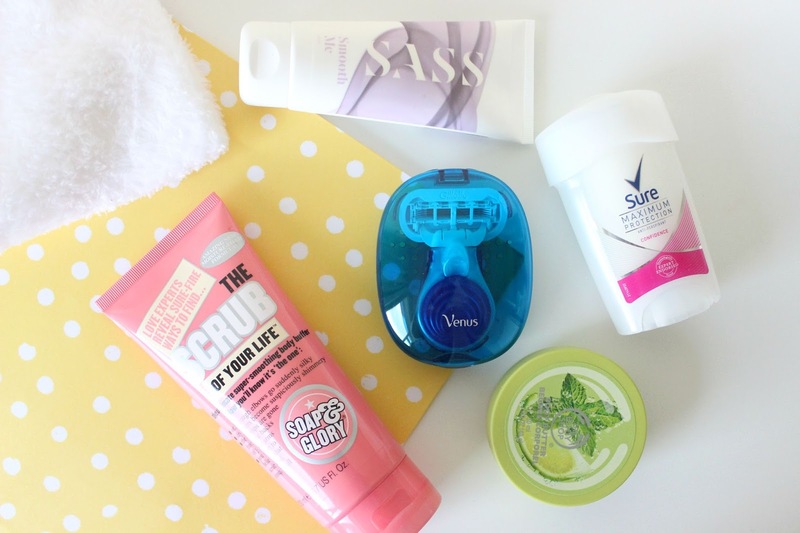 I can't really believe I'm raving about a deodorant on my blog, but it deserves it, truly it does. What are your current body care faves? Are you in love with a deodorant as much as I am?